In 1969, man conquered the Moon, Satyricon by Federico Fellini hit the cinemas and Led Zeppelin published their first album. In the same year, young people from all over the world gathered at Woodstock in the name of rock. This year of small and big revolutions also marks the formation of Italpresse Industrie, which began a journey of collaboration and ultimately merged with Gauss Automazione to become the home of Italpresse Gauss technology. Click on the + icon to read about the important milestones. Italpresse Industrie was born in Capriano del Colle in Brescia, Northern Italy which has been the hub of the die casting industry in Italy for more than 70 years and remains the headquarters of the brand. In the same year Gauss Automazione developed an automated system to convey cast aluminium from the holding furnace to the high pressure die casting (HPDC) machine. Italpresse Industrie and Gauss Automazione worked together on their first joint project – the development of the world’s first automatic work cell. Italpresse Industrie and Gauss Automazione officially merge, bringing together the expertise, flair and engineering excellence of two leading Italian die casting manufacturers. Creation of a global network: with 70% of equipment being exported to overseas customers, the company decided to open strategic locations in Mexico, United States and China. Italpresse created a prototype of the world’s first toggle free two platen high pressure die casting machine while Gauss delivered even more automated solutions for gravity die casting. Italpresse Gauss realises the concept of Industry 4.0 for customers with the launch of HMe – an intelligent machine supervision tool for real-time data storage and mining. Italpresse Gauss becomes part of Norican Group, home to four leading global brands: DISA, Italpresse Gauss, StrikoWestofen and Wheelabrator, with digitalisation solutions from Norican Digital. Throughout the last 50 years Italpresse Gauss has been at the leading edge of technology development and we would like to remain in this position also in the next 50 years. For over half a century, we have focused exclusively on light alloy high pressure die casting and gravity casting with constant attention to the needs of customer’s big and small. Prompt local assistance means we can help light alloy manufacturers exceed their aluminium casting needs with intelligent, high quality, technologically advanced high pressure, gravity and low pressure die casting solutions and automated cells. Our extensive foundry experience means we know what is important to customers. That’s why for us, ongoing partnership, best practice sharing and prompt local assistance are just as important as the equipment performance. In 2017, Italpresse Gauss became part of Norican Group, which brings together four world leading metal specialists – DISA, Italpresse Gauss, StrikoWestofen and Wheelabrator in a consolidation of expertise spanning everything from melting and casting to surface finishing. 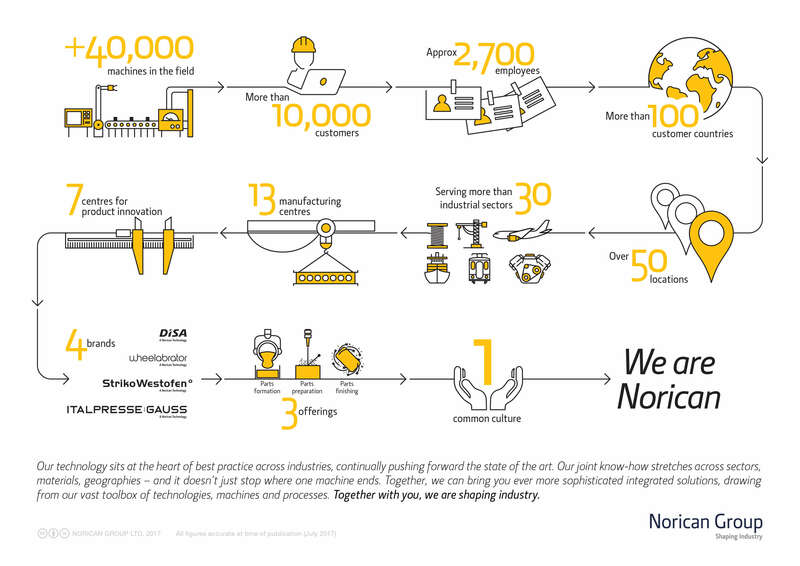 Being part of the Norican Group adds to our technical and logistical capabilities. As well as being able to tap into the group’s international infrastructure, a culture of collaboration means we share insights into our specialist sectors of automotive, agriculture, infrastructure, energy and aerospace. Over the last 20 years, we have established a presence in strategic locations such as Mexico, China and the United States. Further to this, our global service network has been significantly strengthened by the Norican Group network, adding local knowledge and customer support capabilities. We are constantly developing new technologies that provide customers with innovative answers to their challenges. The technological integration between product, service and user is the number one priority. In recent years, we have pioneered product development in technology and design with the introduction of the TF toggle free high pressure die casting machine, automation integration, the development of the electrical gravity die casting machine, and in the field of digital innovation and automation with the release of AMe and HMe – two revolutionary systems to help customers unlock productivity and greater functionality via data insight. Adding strategic oversight to the development of digital technologies for foundries, Norican Group launched Norican Digital as a dedicated Industry 4.0 resource for the brands in 2018. As well as pooling together digital expertise and sharing high-potential developments across the group, Norican Digital is constantly developing IoT Technologies. The ultimate aim is to empower customers with digital transformation. This will revolutionise operations in the metalworking industry by significantly improving production processes and increasing productivity. Covering every aspect of light metal casting, simplifying access to complex and sophisticated casting solutions.